The climate is perfect, the soil just right, the grapes just so. But the occupied West Bank is not obvious wine country. The growing number of vineyards are punctuated by checkpoints and watchtowers, as well as Palestinian towns and Israeli settlements. This is land which Israel conquered 42 years ago. But the Jews who have settled the West Bank will tell you their roots in this land lie much deeper. Yaakov Berg, a fresh-faced wine enthusiast in his 30s, lives in a small shack in the hilltop settlement of Psagot, which abuts the Palestinian city of Ramallah. 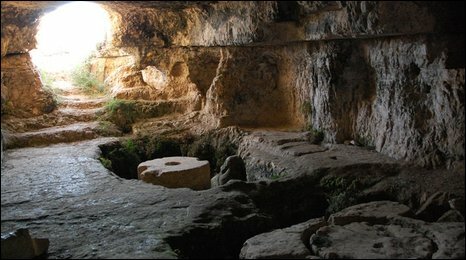 In a nearby cave is what Mr Berg proudly says is a 2,000-year-old wine press, proof of the Jews' ancient presence here. He dances a little jig on the old round stone, to demonstrate how the grapes were once crushed. A short drive away lies his own winery. Opened only a few weeks ago, it is the swankiest in the West Bank. "The wine is the main thing," he said, amid a tower of oak barrels. "But also we think it's very important to explain to people: listen, we are here, back. And part of that is that we work the land again." 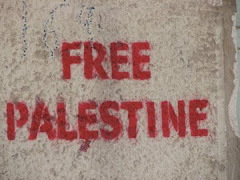 Settlement of occupied territory is illegal under international law. But the Settlers' Council has grand plans for the Psagot winery. The Council is talking about building as many as 20 holiday homes around the winery. Wine-making, the Council's General Secretary, Pinchas Wallerstein, says, "is some kind of new development... a new way to settle people in the area, even more permanently than mobile houses". Those mobile houses are sprinkled throughout the West Bank. Many of them are at what the Israelis call outposts - smaller, newer settlements that are unauthorised by the government. One of the outposts, Rehelim, is home to another boutique winery. Erez Ben Saadon labels and stores his Tura wine in a small, strip-lit concrete shed. His vineyards lie in majestic undulating sweeps at a settlement nearby. Passionate about his job, he kisses the budding grapes in an emotional flourish. And his passion extends to his view of US President Barack Obama's demand that settlement activity stop. "We're a democratic state," he says. "The only democratic state in the Middle East. And I think the most un-democratic thing happening today is the American administration trying to force us into doing things that go against our own election results." A couple of hours' drive away, the salons of Tel Aviv are a world apart, the traditional home of Israel's trendy lefties. But on a swish roof terrace, at an evening tasting for Erez Ben Saadon's wine, the praise gushes. "The Merlot is excellent," says Shai Segev, wine critic for the Yediot Ahranot newspaper. Mr Segev says its provenance is unimportant as "wine and politics don't mix". But Israel's leading wine critic, Daniel Rogov, says there are domestic and overseas consumers who "simply won't" buy the wine because it comes from the occupied West Bank. In contrast, he says, there are others who lean more towards the "right-wing, Orthodox Jewish side, who will hunt out these wines precisely because they come from there". Mr Rogov describes himself as a "peacenik". 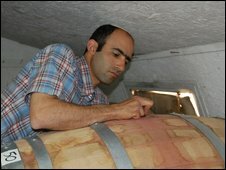 He refuses to travel to the West Bank, but will review its wine, if it is brought to him inside Israel. Year on year, he says, the wine from the occupied territories is not just increasing in quality, but quantity. The scale of the project is evident as you drive around the West Bank past hill-sides marked with newly cleared swathes of land. By the settlement of Har Beracha, 10 hectares are due to be planted with vineyards within the next two months. 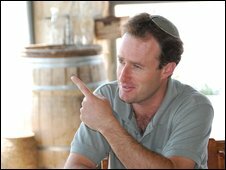 As Shivi Dror, another West Bank winemaker, put it: "When we take over 100 dunams (10 hectares) of land with a single vineyard, it's the same amount of land that 200 houses would cover." 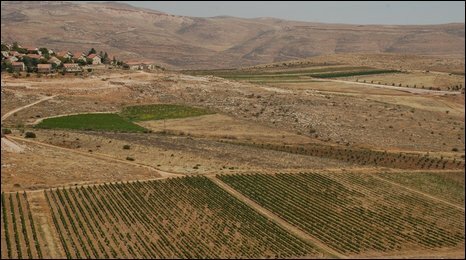 But the neighbouring Palestinian villages say some of the vineyards are being planted on land that is theirs, not just in the sense that it should be part of a Palestinian state, but because they privately own it. Ibrahim Shabana owns a grocery store in the village of Sinjel. He says settlers are growing grapes on land which has been in his family for more than 100 years. All that is left for him are a few, straggly vines of his own, on a small, uneven field. "I feel hopeless," he says. He says that he cannot fight the settlers, for fear of violence or arrest by the police, "while the settlers get off free". For their part, settlers argue that claims of intimidation or theft are often made by Palestinians and seldom proven. The Israeli human rights group Yesh Din has begun to track the spread of the vineyards. It says the settlers' insistence that they are only planting vines on state-owned land is simply not true. On a road overlooking the West Bank vineyards close to the settlement of Shilo, the group's energetic Land Projects Coordinator, Dror Etkes, unfurls a map on the baking hot bonnet of his car. It is, he says, just one illustration of how vineyards take over land beyond what even Israel says are the authorised boundaries of the settlements, across privately owned Palestinian land. In a statement, the Civil Administration, the Israeli authority which oversees the West Bank, confirmed that the information on the map is correct. Mr Etkes says that dealing with this issue should be a matter for the Israeli authorities, not the American administration. The scene in front of us, he says, shows how the Israeli government has given a "free ticket" to Israeli settlers to "take as much land as possible in order to Judaise the maximum part of the West Bank". President Obama has warned that the cost of the settlement enterprise is about to rise. In the meantime, the ambition and spread of the West Bank winemakers continues to grow. So now it´s official: there is no innnocent pleasures any more. Of course, this doesn´t come as a suprise in a country where the "accidental" death sentence is accepted as an adequate punishment for a stone throwing (Palestinian) youth of 13 yrs. So now even the most wonderful, ancient and sensual traditions such as winemaking are being abused for settlement politics. No doubt, the Israelis are making some fabulous wines but as a wine lover I can´t help but asking: how can you possibly spoil the pleasure of revelling in aromas and flavours by instrumentalising grapes to occupy land which is belonging to someone else? Is it only me who is seing a great potential of cooperation and possible reconciliation in wine making in the region? Aren´t dedicated winemakers bound to be allies? If it is happening in South Africa, there is no excuse why it shouldn´t be possible in any other region. May I remind the world of the more than drinkable Palestinian wine being produced by Christian Palestinians in Bethlehem? Isn´t wine making a tradition which is so much older than 2000 years? To me this is yet again another proof of how self-assured these settlers are and how little they believe in a change of international politics. Any passionate wine maker in the world knows that you won´t put all your energy, knowledge, skills and last but not least money in a vineyard which is going to be removed a few years down the lane. It takes far too long for the grapes to get to a stage where you can produce high class wine. And we all know about the winegrowers pride in his most mature vine. This is not a short term adventure, this is a commitment for a few generations. I would like to ask a few questions. If the wine itself was the most important thing, why does it have to be in an illegal setting, strongly connected to the purpose of creating a fait accompli? If you are only interested in wine growing and making, wouldn´t it be much more beneficial for the purpose to do so in a place where you can fully concentrate on your grapes without any disturbances from the outside world? And as far as the 2000 year old wine press is concerned: do you really want us to travel back in time and find out who precisely was making the wine then? Should we change the entire world order back to what it was like 2000 years ago? What are we going to do with the territories which were occupied by societies/ethnicities/tribes which are simply not existing any more? And what about the territory which was waste land? Are we going to reduce the world population back to the figures of 2000 years ago? And how do you suggest should we do that? Mr Wallerstein: these holiday homes, are they going to be available to anyone being able to afford them? And do you consider land annexation to be a recreational activity? Democracy seems to be an important value to you. Is it a democratic tradition to build an estate on highly disputed land, unauthorized by your democraticly elected government? Surely, of a person who is able to develop such a passionate relationships to your grapes (which I can very well relate to), you would expect the desire for at least moderately affectionate relations with his neighbours? Especially when we remember good neighbourship to be a very old wine makers custom, surely you wouldn´t consider plants to have a stronger right to adequate living conditions than human beings? 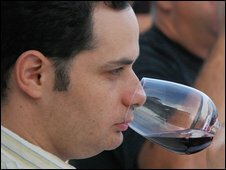 Mr Segev: your are being quoted with: "wine and politics don´t mix". Hm... how come your are tasting wines of producers who publicly announce that they are very much mixing the wine making business with a claim to land? 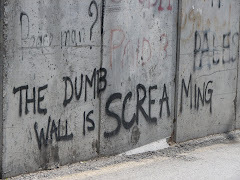 Shouldn´t you preach this very statement to the owners of unauthorized vineyards in the occupied Palestinian territories instead of making it a weak excuse for not living up to a political standpoint of your own? The Merlot is not going to speak up for himself - give him a voice! Mr Rogov: I appreciate your call for peace and believe in your honourable intentions. Acknowledging your sincerity I wonder whether you would still be tasting the settlement wine, if you indeed travelled to the West Bank? Mr Dror: What do you think about the statement that wine and politics don´t mix? Is it a passionate wine maker´s tradition to plant as much quantity as possible or isn´t it rather quality we should be speaking? From your statements I get the idea of vine growing to be a cheaper way of occupying land rather than anything else? 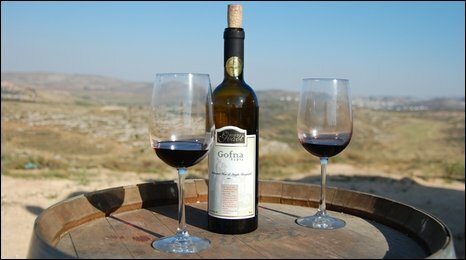 During my stay in the West Bank I travelled to Israel a few times and being a passionate wine lover I have to admit I tasted a few delicate Israeli drops as well as Palestinian wine. Learning about the wine culture in a region is part of my way to discover the world and connect to a region. After reading this article, I must say the grapes have grown sour on me. nothing is illegal here. Jews are living in their homeland and as in years past are growing vineyards and producing wine. "Palestinian wine"? But isn't alcohol prohibited? Oh, yes, there is beer and perhaps you were staying with Christians. Gets complicated. "Family honour and rights, the lives of persons, and private property, as well as religious convictions and practice, must be respected. Private property cannot be confiscated." "The occupying State shall be regarded only as administrator and usufructuary of public buildings, real estate, forests, and agricultural estates belonging to the hostile State, and situated in the occupied country. It must safeguard the capital of these properties, and administer them in accordance with the rules of usufruct." The Israeli government has been engaged for more than 35 years in the relocation of Israeli nationals to the territories it occupied as a result of the 1967 war through various programs facilitating, supporting, encouraging and enabling the establishment of Israeli settlements in the OPT. It is also a well known fact that the Israeli government is spending large amounts of money each year on subsidies for the settlements. I dare say we are closer to the statement "everything is illegal here" as opposed to YMedad´s "nothing is illegal here". No, I have not been staying with Christians (except for my team and their approach to Christianity is not entirely mine either, but that is a different story) and yes, I have been referring to wine produced by Christian Palestinians as stated above. While alcohol is prohibited in large parts of the West Bank, it is being produced and served quite publicly in Bethlehem and Ramallah. This of course, is something you can´t know, unless you have been there. I don´t find that all too complicated. "Sixty years after its foundation, Israel refuses to accept that it should exist for the sake of its citizens. 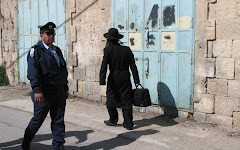 For almost a quarter of the population, who are not regarded as Jews, this is not their state legally. At the same time, Israel presents itself as the homeland of Jews throughout the world, even if these are no longer persecuted refugees, but the full and equal citizens of other countries." "...Jews worldwide have always tended to form religious communities, usually by conversion; they cannot be said to share an ethnicity derived from a unique origin and displaced over 20 centuries of wandering." Enough said. But thank you for triggering me to reflect and contemplate on these issues again and for giving me the opportunity to comment. The term "occupied territories" refers to land that was part of a country and taken over by force by another country. Historically the last independent country that existed on the land west of the Jordan river was the Jewish kingdom that was concurred by the Romans in 73 AD. Jewish soldiers died fighting the imperialist army and survivors of that horrific war were marched away in chains to slavery. The Jewish people never gave up hope to return to this land. The entire Jewish culture revolves around the theme of the holiness of this land and the national aspiration to return. In the past 2000 years while there was no independent Jewish rule on this land, there was also no other country established here. 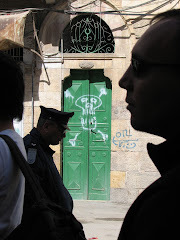 From the time of the Jewish exile no other people had a king or capital centered here. The land has been occupied by an exchange of foreign powers since 73 till 1967 when it finally returned to the hands of its rightful owners. In 1947 the UN suggested a partition plan that would re-establish a Jewish state on parts of this land and also establish a new country for Arabs who had settled in the land. The Arab states and leadership refused to accept this and went to war with the newly formed Jewish State in an attempt to "throw the Jews in the sea". As result of that war the "West Bank" was occupied by Trans-Jordan for 19 years and Gaza strip by Egypt. During the period of Arab occupation no real effort was made to establish a independent "Palestinian State. In short, your claims of illegal activity by Jews and the Israel government are baseless and antisemitic. There is no other people who have more of a historical or legal claim to settle and live on these lands. So, yes, we will continue to plant grape vineyards and raise our families on our historic homeland. Neither am I understanding nor antisemitic. I will not comment on the statement above, it speaks for itself. There is no censorship on this blog. I believe in people´s ability to form their own opinion. The commment by David Ha`ivri is very representative for a large group of settlers in the West Bank. Are all critical voices Anti-Semites? Does this mean you can never criticise any person of Jewish faith without automatically becoming an Anti-Semite? And does this apply to Jewish critical voices as well? Can you be Jewish and Anti-Semite at the same time? And finally: aren´t the Arabs Semites as well? There is a difference between criticizing certain policies of Israel versus demonizing Israel or holding Israel to standards, which for Israel to live up to would spell out suicide. For example, criticizing Israel for defending herself against continuous missle attacks on kindergartens, hospitals, playgrounds, etc., while failing to criticize Hamas for hiding behind women and children as shields is, at the very least, holding Israel to unrealistic double standards, or, at the very worst, subtle anti-semitism disguised as “criticism of Israel”. ABSOLUTELY. Throughout our history, some of the worst anti-semites were Jews who turned against their own people. For example, during the Spanish Inquisition, “converses” (i.e. Jews who converted to Catholicism) would be the first to turn in their fellow Jews to the Inquisition. The more things change, the more they stay the same and today is no different. For example, one of the founders of ISM (International Solidarity Movement) is Rafael Cohen, a Jew. And then there is Paul Eisen, Norman Finklestein, and many others who are either demonizing (to be distinguished from “criticizing”) Israel or even calling for Israel’s dismantlement. [Quote]And finally: aren´t the Arabs Semites as well? [Quote] Most people associate the word anti-semite with being anti-Jewish, whether against the Jewish people or against the Jewish faith. However, if you want to get hung up on semantics, would anti-Jew make you feel better? Again I am publishing this comment for the interested public to form an opinion of its own. Sue, let me a bit more detailed. The area of Judea, Samaria and Gaza was intended to be the reconstituted Jewish national home by international law as a result of the San Remo Conference and the League of Nations Mandate decision, 1920-1923 after the area of Transjordan was separated administratively from the Mandate. Starting in 1937, as a result of murderous Arab terror and anti-Jewish pogroms intended as a campaign of ethnically cleansing Jews from hebron, Gaza, Jenin, Nablus, etc., partition was recommended. In 1947, the UN adopted partition but the Arabs as always rejected it, trying to destroy the Jewish state that was to arise. 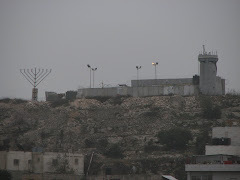 Villages in Gush Etzion, Atarot, Neveh Yaakov, and the Jewish Quarter of Jerusalem were razed. In 1967, we Jews came back to our territory. Geneva doesn't apply in this instance in a political sense. All Israel has to do is protect humanitarian rights, not establish an Arab Palestinian State. I do not accuse you of antisemitism. I hope all that's the problem is a misunderstanding and lack of full knowledge of the history of the conflict. Ignorance is no crime although it can cause a lot of problems. Arabs live throughout Israel. Jews cannot live in Shiloh, Bet El and Hebron where they founded two kingdoms, a commonwealth and a culture and religion and despite being exiled, constantly returned throughout 1800 years? Place-names also reflect anti-Jewish sentiment. 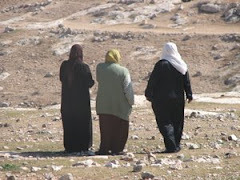 "West Bank" is Jordanian illegal occupational term for Judea and Samaria. "Nablus" is Arabic for "Napolis", a name given to Shechem by Hadrian, the Roman emperor who de-Judaised the region. He also re-named Jerusalem to "Alea Capitolina". Yet, Jerusalem we still call Jerusalem. The Jewish people survived written history Sue, we will survive you too. Judea and Samaria are the very Land G-d gave to the Jews and if you read your Bible, you'd know. I strongly distance myself from the comments made above (other than my own). I take on no responsibility whatsoever for the content of these comments. I am publishing these comments because they display very clearly what is at the core of this conflict. This is the arguments we are dealing with.